This amazing technique was created by a woman thousands of years ago in China. It's easy to do and very effective. Look at the video below to see this punch in action... it's possible for a normal person to achieve over 8 punches per second! It's virtually impossible for an attacker to defend against a punch at this rate. Whether you're a man, woman, or child... if you want to protect yourself or your family, you owe it to yourself to learn the secret to this technique. 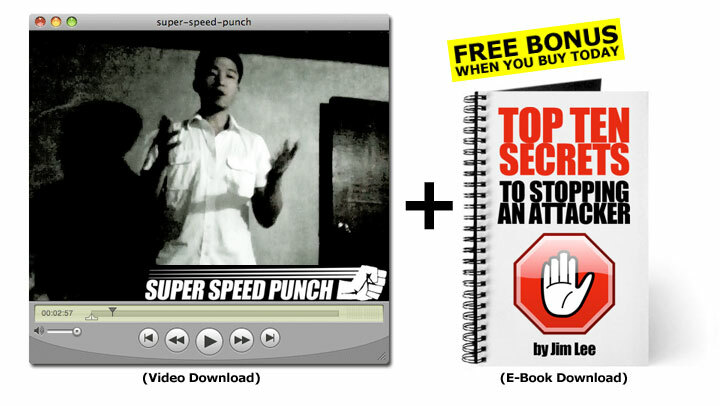 Hi, my name is Jim Lee and today I will show you the secret on how to do the super speed punch. I like martial arts because it doesn't rely on pure strength to defend yourself. Instead, it uses the science of physics to achieve amazing results. A great example is the technique of the super speed punch, which was originally created by a woman. In using this technique, she was able to defeat much larger and stronger opponents. When you are armed with this information, you'll be able to achieve great power, speed and accuracy. Your hands will become a lethal fighting tool when you combine this punch with the knowledge of vital striking points I show you. Please note that with power, one should have the wisdom and responsibility of how to use it. I am teaching you this technique today only for the purposes of self defense. If you intend to learn this technique for offensive reasons, please don't read on. I am anti violence, and I am offering you this instruction in an effort for self protection and to stop an attacker. Be prepared today, because you never know when you or someone you love is in a dangerous situation. NOTE: You'll receive the video & free bonus e-book immediately after payment.